in Helios - 9 1/2 inch. 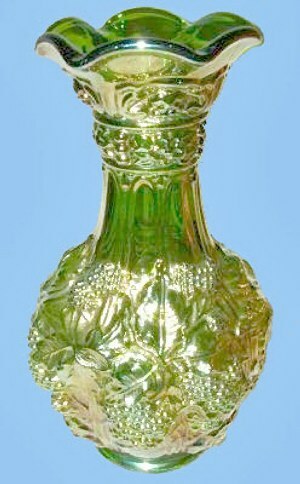 SCROLL EMBOSSED in Helios Green - PLAIN Exterior. 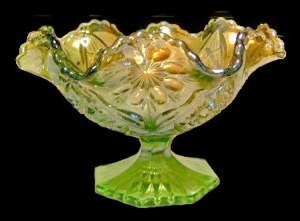 SCROLL EMBOSSED Compote and plate: The small compote with plain exterior as well as the larger size compote having Curved Star exterior were produced in this unusual green labeled helios by collectors. 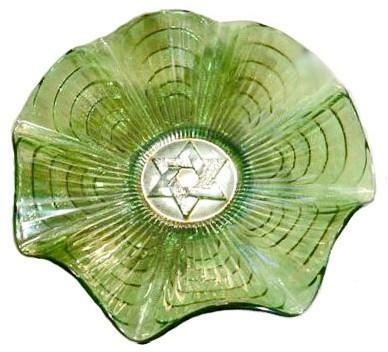 9” plates are found in this silver-green color. 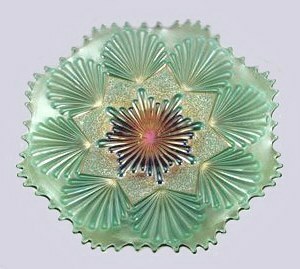 Marigold, purple and aqua are other colors known in the plate shape. in Helios - 4 in. tall. 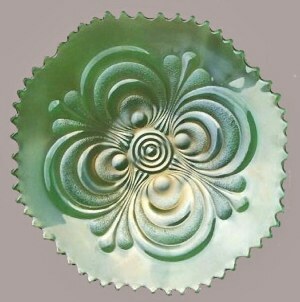 Typically silvery finish on Helios Green WINDMILL Dresser Tray. 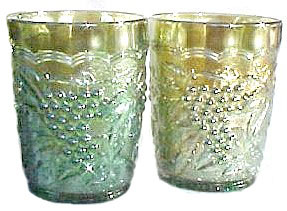 IMPERIAL GRAPE Tumblers: Plain and ribbed interiors are found in these tumblers, with the ribbed variety being somewhat more difficult to locate. The helios and marigold examples having ribbed interiors are easy to find. Purple examples are more difficult. There are, of course, water pitchers available to accompany these tumblers in helios. 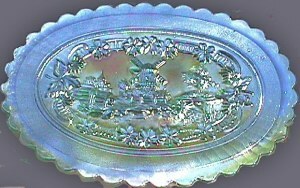 WINDMILL Dresser Tray: These oval trays are rather scarce in any of the known colors: marigold, purple, helios, aqua. However, helios examples are more available than marigold. 474 Compote: Only marigold and purple were production colors in the vintage variety. 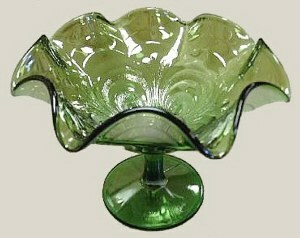 The pattern was reproduced during the 1960s and 1970s in this compote shape and a vase. They were clearly marked with the IG trademark! SHELL or SHELL and SAND: The 8-9” bowl, and the 9” plate was produced in helios, along with marigold, purple and smoke. They are always nice and flat and display beautifully, whether in the Shell or Shell and Sand (stippled) design. STAR of DAVID: Found most often in spectacular purple, helios examples are the next most frequently found color. Marigold is a scarce color, with smoke being downright rare! Imperial's ARCS pattern graces the exterior and shows through to the interior of the piece with nice clarity. RIPPLE: Here is a pattern of delight for many collectors. Squat, Standard, Mid-size funeral and Large size funeral in five different molds offer an impressive array of base sizes and heights to select from. 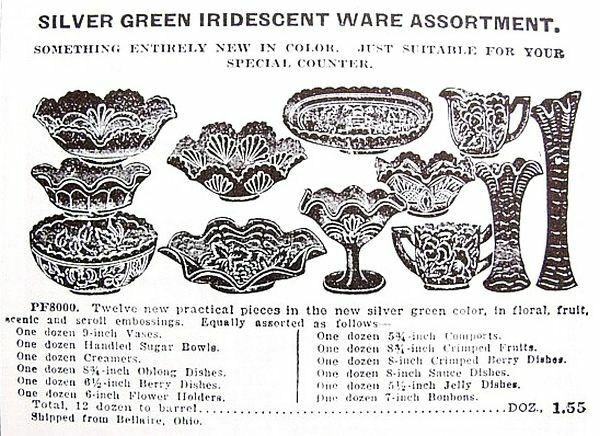 In other words, you may choose to search for vases in helios color beginning with 5” extending on up to 21”! How long it might require to attain those 16 examples should make a challenging and lengthy experiment. 5 in. tall x 7.5 in. across top opening. COLUMBIA Vase: Carnival shapes in this Imperial #246 design include vases, bowls, rose bowls and a flat plate, all made from the same mold. 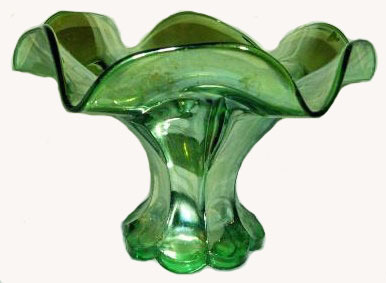 The stemmed compote is a separate mold. Of the shapes mentioned, only this vase was produced in helios, with marigold being the dominant color. Additionally, plates are found in clambroth, the ruffled compote in purple and there are a few purple and smoke vases. marked IG - 10 in. tall. LOGANBERRY: 10” vases are found in marigold, purple, helios, emerald, amber and smoke colors. 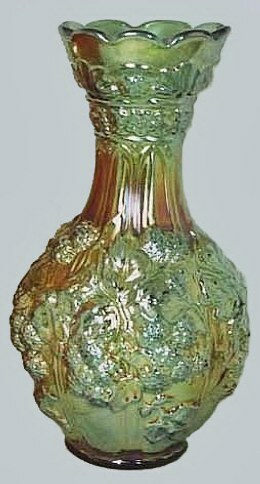 Additionally, a flared top whimsey vase in amber and one with a ball-shaped top in purple are known. The vases were reproduced in the 1960s and 1970s to include colors of marigold, smoke, helios, and white. They were all marked with the familiar IG trademark. that he will also reap. But he who sows to the Spirit will of the Spirit reap everlasting life. for in due season we shall reap if we do not lose heart.